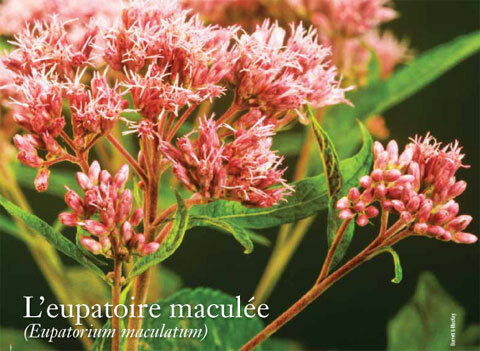 Range: The Spotted Joe-pye weed is native to Canada and can be found in all provinces except Prince Edward Island. Habitat: You can find this plant in meadows, shorelines and damp thickets. This plant feeds several species of butterfly including orange sulphur, pearl crescent, painted lady, giant swallowtail, tiger swallowtail, variegated fritillary, pearl crescent and red admiral. Notes: The relatives to the spotted joe-pyed weed include the hollow Joe-pye weed (E. fistulosum), common boneset (E. perfoliatum), and the sweet-scented Joe-pye weed (E. purpureum). If you see it take time to appreciate its rough beauty and ability to stabilize stream banks, but keep an eye on this aggressive plant on your own property. Folk accounts disagree on whether Joe Pye himself, who is said to have used the plant to treat typhus among early American colonists, was a European or belonged to a First Nation. The root was used to cleanse the system by increasing sweating and urination — it is still commonly used in homeopathic and herbal remedies.